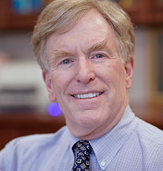 Dr. Stapleton received his undergraduate and medical degrees from the University of Kansas. In 1979, Dr. Stapleton joined the faculty at the University of Tennessee Center for Health Sciences in Memphis, Tennessee. While at the University of Tennessee, he founded a pediatric General Clinical Research Center and served as its Director of Research at the LeBonheur Children's Hospital. He has over 250 scientific publications. From 1989-1995, Dr. Stapleton served as the A. Conger Goodyear Chair of the Department of Pediatrics as well as the Pediatrician-in-Chief and Medical Director for the Children’s Hospital of Buffalo. Dr. Stapleton has served as President of the American Pediatric Society and President of the Association of Medical School Pediatric Department Chairs. He chairs the Data Safety Monitoring Board for the National Study of Kidney Disease in Children for the National Institutes of Health (NIDDK). He also has served as Secretary-Treasurer and President of the American Society of Pediatric Nephrology; Assistant Secretary-General and Treasurer of the International Pediatric Nephrology Association; President of the Southern Society for Pediatric Research; and Chairman of the Sub-Board of Pediatric Nephrology of the American Board of Pediatrics. He is the founding Editor-in-Chief of NEJM Journal Watch Pediatrics and Adolescent Medicine and is Co-Editor-in-Chief of UptoDate, Pediatrics. He has been honored with the Distinguished Medical Alumnus by the University of Kansas, American Society of Pediatric Nephrology Founder’s Award and the Ira Greifer MD award for lifetime contributions to the International Pediatric Nephrology Association.